INTJs are fiercely loyal once they care about you. Once you earn their trust and they consider you a friend, you can bet they’ll want the same kind of loyalty from you that you’re getting from them. Betraying an INTJ is the fastest way to end the friendship. You’ve heard of INFJ doorslams, right? INTJs can be just as bad, or even worse. You get doorslamed by an INTJ you might as well not exist anymore. Many INTJs want friends but they’re also perfectly capable of being happy on their own, thank you very much. Smothering them with attention is not the way to prove that you’re worthy of being in their close friend circle. You need to give your INTJ friend space or they won’t trust you enough to share their time with you. Also, don’t try to control an INTJ. That never ends well. Contrary to rumor, INTJs do have feelings. Your unkind words can hurt them deeply, but you can also hurt them with insincerity. They would much rather have you “tell it like it is” than talk in circles trying to protect their feelings. If they can’t trust you to be honest, they won’t trust you at all. Just be sure you treat them with respect while you’re being honest. INTJs use Extroverted Thinking to interact with the outer world, and they lead with Introverted Intuition. They’re not going to be interested in close friendships with people who can’t engage these sides of their personality. They want friends who can and will participate in debates about interesting topics and deep-dive into abstract theories. The exact conversation topic will vary depending on the individual INTJ, but they need friends who can engage them intellectually. INTJs are not quick to trust people. They need people who are going to stick around, who won’t get offended if the INTJ wants to argue/debate with them, and who plan get-togethers that will give the INTJ plenty of opportunities to get to know this person. Most people stay at the “acquaintance” level for quite a while before the INTJ trusts them enough to consider them a friend. You need lots of patience and a commitment to sticking around if you want to be friends with an INTJ. If you’re friends with an INTJ, don’t just assume they don’t want to be included in something. Invite them and give them the option whether or not to hang out. They might turn you down, but don’t make them feel guilty if that happens and keep asking. INTJs need to know you want to spend time with them, and if you keep offering to include them they will appreciate it. They will make sure they spend time with their friends, and may surprise you by how often they accept your invitations. Many INTJs have difficulty processing emotions and/or connecting with other people. INTJs need friends who will be okay with the fact that the INTJ can’t always empathize with them (though they will listen). They also need friends who will try to see things from the INTJ’s perspective. Someone who’s really willing to listen to the INTJ, try to understand them, and ask relevant questions to clarify their perspective is invaluable to an INTJ. You’ll also need to keep doing this. Misunderstandings can easily happen if you and your INTJ friend don’t work on communication and understanding. One way that INTJs show they care about someone is by solving their problems. They want you to accomplish goals, fulfill your dreams, and work through that thing you’ve been complaining to them about. They’ll often be pretty blunt in how they communicate their views about what you need to do, and they need you to know that they’re being hard on you because they care. They also love it when friends want to strategist with them and solve problems together. INTJs might seem like they have tough skin, but they can be deeply affected by criticism or discouraging situations. They don’t appreciate empty platitudes like, “Don’t worry; it’ll all be okay in the end.” But they do need people in their lives who can provide concrete encouragement. They need friends who will remind them that they’re not stupid, they’re not failures, and that they are valuable (preferably with evidence). INTJs fear being seen as stupid or mediocre. A good friend will be able to help them realize that a set-back or mistake doesn’t have to define their lives and encourage them to keep going. INTJs place a high value on respect. They absolutely cannot stand it when people undervalue their opinions, cut them off in conversations, or dismiss them as unimportant. Also, you should never share private matters or belittle/criticize an INTJ in front of other people. While they aren’t usually seen as a “social” type, they care deeply about how they are viewed in their social circles. They want to earn respect, and if you can’t see that or honor those desires you’re not going to make it into the friend circle. No amount of love and understanding can make up for consistent lack of respect. INTJs can make wonderful friends. I should know — my INTJ sister is one of my best friends. 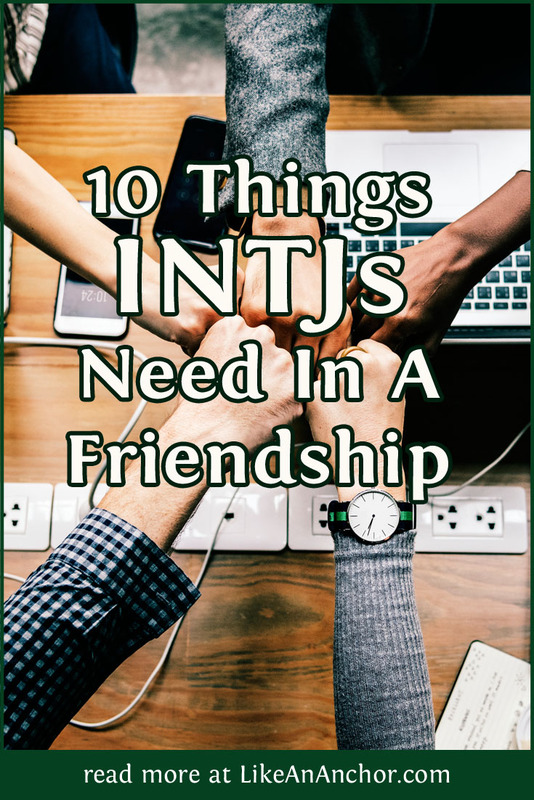 If you need further convincing, Susan Storm has a great article called “7 Reasons Why You Need an INTJ Friend in Your Life” (click to read it). I hope these 10 points help you build better friendships with INTJs. 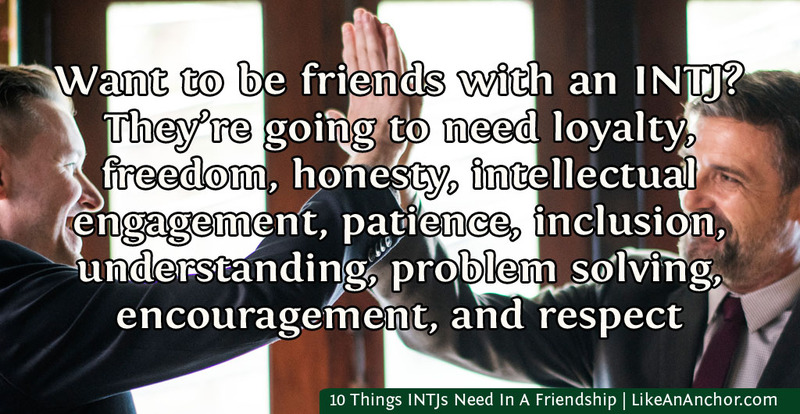 I also know these probably aren’t the only things that INTJs need/want in a friendship, so I’d love to hear if there’s anything you’d add to this list. If you’re an INTJ, what are the most important things you’re looking for from your friends? If you’re friends with an INTJ, what tips do you have for keeping that friendships strong? Share your thoughts in the comments! That’s what I get for writing this so late last night. Thanks for catching the typo! There are some definite truths to this article. I really enjoyed reading this! One that I think possibly falls under several headers on here, but perhaps could be pointed out separately is having our advice ignored. I find several of my friends understand that if they come to me for help, I’ll be blunt and logical about it, though respond with their best interests in mind. However, when this advice is ignored, this can become frustrating and tiresome. Time and energy goes into a response, and dismissing that is in many ways akin to dismissing me as a person. These aren’t friendships that are likely to make it past the so called “door slam”, unfortunately. We’re not the ones to bring problems to if all a friend really wants is just to be agreed with. That’s not how we work – INTJ Female. INTJ female here. Thanks for writing this. Another thing I think is to be open to different ways of communicating, like texting or e-mails rather than talking on the phone (I’ve grown to hate the phone). Also, just being next to a friend in silence. Witty banter or joking around is great, too. I think we’re really misunderstood. I agree with this. I hate it when my extroverted friends “demand” I talk to them one-on-one or on the phone when my brain processes things differently than theirs. I can’t just throw out responses when they want me to and it frustrates us both. At the very least they should let me leave and come back with better points; points that I wouldn’t have had the freedom to think of while they’re in my face. Yes. We need that time to reflect.